While NEAROF! often leans towards the sweet side of things, we’re not averse to an occasional detour into savoury country. And French onion soup? Well, that’s nice and savoury, if by savoury you mean full of salty goodness. 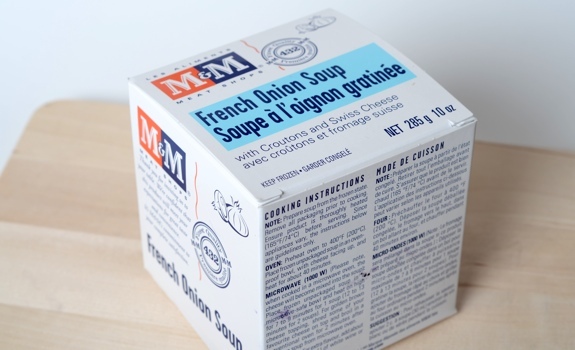 This boxed cylinder of frozen soup, complete with cheese and croutons on top, comes from M&M Meat Shops, a chain of stores in Canada that specialize in frozen foods built for convenience. As someone who loves French onion soup, but who generally doesn’t have the time to make a fresh batch from scratch, these boxes are a wintertime guilty pleasure. The Look: A very boring, utilitarian cube-shaped box, which, I should note, is good for stacking in a freezer. 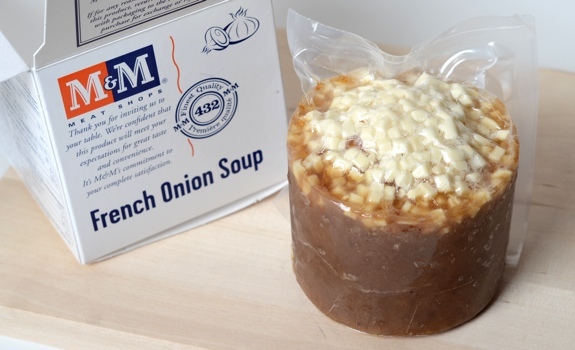 Inside the box is a plastic-wrapped portion of frozen French onion soup. Looks odd, yes, but not bad. The Preparation: Throw it into a microwave-safe bowl (I’ve got some French onion soup bowls, so I use one of those to complete the experience), then zap in the microwave. You can re-heat it in the oven if you want, but it takes way longer and burns up more electricity. The only downside to the microwave preparation is that the cheese gets melted into the soup, and doesn’t stay in a layer on top. An OK trade-off, though. The Mess: Oooooh, boy. The instructions said to nuke it for 7 to 9 minutes, so I picked 8. But my microwave was stronger than expected – not by a lot, but clearly by enough. Bubbling soup all over the place, including sticky baked-on cheese. There was some scrubbing required. Lesson learned. Next time, maybe 5 to 6 minutes, keeping a careful eye on the soup. It can – and will – boil over if you’re not careful. The Taste: Like French onion soup: salty with lots of onion and beef broth flavour. The textures are also good: stringy bits of onion with chewy strands of cheese and mushy bread. Thick and soupy. 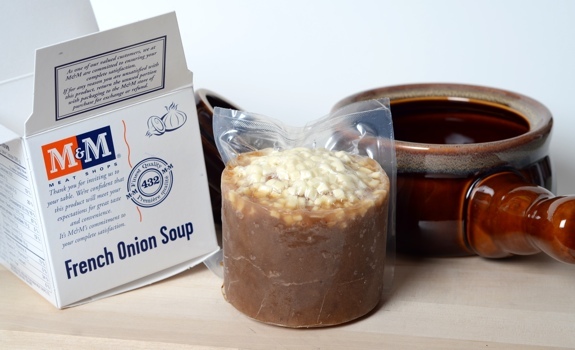 A perfectly serviceable French onion soup for those days when you want something a tad fancier than a tin of minestrone. I can't help but find the idea of soup sold by the boxed, frozen cylinder a bit creepily futuristic. Value for cash money: OK. Compared to a tin of soup, not good. But compared to the effort necessary to prepare your own French onion soup from scratch? Decent. Nutrition? : Per 1 soup (285 grams): 200 calories, 8 grams of fat, 1370 mg of sodium (holy cats, that’s high! ), 3 grams of fibre, 16 grams of protein. Also, 34% daily value of calcium, 10% daily value of vitamin A, and 6% daily value of iron. The verdict: Worth keeping a few in your freezer for when you’re craving something warm, salty and cheesy. Just make sure you haven’t had anything else with salt in it all day. If you’re going to be making more than one or two at once, the oven option starts to look better — and it should yield a prettier, less sloppy looking soup. A very high majority of M&M Meat products are very high in sodium. Even the frozen chicken breasts they brag about are loaded with salt. To be frank, eating food high in sodium will in fact kill you because this causes high blood pressure and puts you at risk for heart attack and heart disease. A pill cannot cure everything. Eat smart. How long does it really take to cook onions and add low sodium vegetable broth? Your heart will thank you. They remind me of oversized hockey pucks! By far the best Fr onion soup you can buy. never used the microwave for it but 45 mins at 400 in the oven, and your good, give it a stir and only homemade can beat it. I agree, baked in the oven, it is delicious. Unfortunately, I can rarely find it in St. Louis. Would love to know what store stocks it on a regular basis. with my first onion soup, i microwaved it frozen per instructions, and it kind of sucked. now, i cut it out of the package frozen, put it in a cylindrical type bowl, and let it melt in the fridge. saves much-o electricity for sure. takes about 2 days to thaw, but i just plan in advance, cause i’m awesome at that. then i microwave for 2 1/2 minutes, and it comes out perfect. cheese stays on the top and croutons and onions very nice. give it a try; you got nothing to lose.